Kids should do this experiment with an adult (allow the adult to cut the lemon peel from the lemon). 1. Cut the tip (neck) of the balloon off. 2. Allow an adult to cut the lemon peel away from the lemon. Using a large cut of lemon peel, make the shape of a scuba diver, boat, fish or missile. 3. Fill the jar with water all the way to the top of the jar. 4. Place the lemon peel in the jar of water. 5. Stretch the balloon to cover the entire top of the mason jar and use the rubber band to seal it in place on the mouth of the jar. Make sure that the balloon is stretched tightly across the top and that it is not loose or sagging. 6. 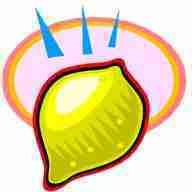 Using your finger, gently press down on the lid (balloon cover) and watch your lemon dive to the bottom of the jar. 7. When you release your finger, watch as the lemon returns to the top of the jar. What happens to the lemon when you press your finger on the lid of the jar? The pressure from your finger squashes the tiny air bubbles in the lemon peel allowing water in which makes the lemon peel heavier and causes it to dive down. When you remove your finger, the air in the lemon peel expands again allowing it to float to the top (as it becomes light again).